American Outfitters Ltd is the only source you’ll ever need for decorated promotional products. Our 30,000 square foot production facility based in Waukegan, Illinois provides in house automated multi-color screenprinting, multi-head direct embroidery, advanced graphic design, and vinyl banners and signs. 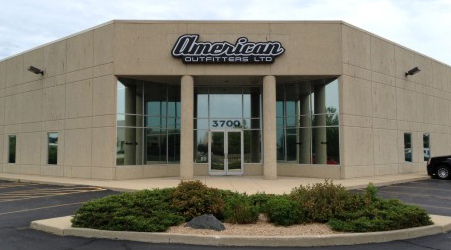 American Outfitters Ltd 3700 Sunset Avenue Waukegan, IL 60087 847-623-3959 Fax: 847-623-0053.
advanced graphic design, and vinyl banners and signs. is large or small, American Outfitters Ltd is committed to providing great quality and service on every project.